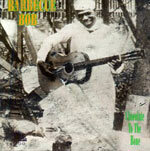 CD review: "Chocolate to the Bone"
Although he only recorded for four years before his untimely death in 1931 at the age of 29, Barbecue Bob (Robert Hicks) continues to enjoy  60 years after his death  a respected place in the blues pantheon. This collection of 20 of his 68 recorded sides shows why. A wonderful singer and melodic composer, Barbecue Bob had a natural charisma that lent his music a warmth and charm that shine through these scratchy (they're taken from the few surviving 78s) recordings. But if the recording technology and quality is old and poor, the music is so overpowering that this is still an extremely listenable release, in addition to its obvious historic value.